We offer riding lessons for children as young as two years of age in a safe, encouraging, fun environment. Some classes require parent participation, and others give kids the chance to spend the day at the barn with our horses and riding instructors. We also offer lessons for adults—beginners or old hands—that allow them to get to know horses, riding, and even grooming. The movement of a horse at a walk mimics the movement of a human body in motion and has proven to be beneficial in training or retraining human muscles. Balance, concentration, coordination, core strength and circulation can also improve as a result of learning riding skills. 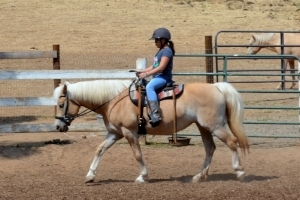 Beyond riding skills, academic education can be weaved into riding lessons and horsemanship. We specialize in personal, one on one lessons and have the unique insight and experience to tailor a lesson of Therapeutic Riding and Equine Facilitated Learning to the specific needs of a client. Bev is a PATH certified Therapeutic Riding Instructor. As a credentialed Special Education teacher, she also specializes in Equine Facilitated Learning. For monthly packs, please select “Subcribe” to link to the purchase form. We offer two different Birthday packages. A Birthday Lesson is for up to two children and the entire 1 hour time slot is spent with the horse. Birthday Parties are for up to 6 children and secure a 3 hour time slot which includes setup and take-down time, 1 hour of riding, and 1 hour of birthday celebration. We have indoor/covered space available for rainy days! A class designed for young equestrians, minimum age of 2 years old, accompanied by an adult. It could be Mom, Dad, Grandma, Grandpa, Auntie or even Uncle Al! It includes reading the Once Upon a Horse storybook which emphasizes safety and fun. We will groom, pet, ride (a lead-line), and feed "Thank You" carrots leaving behind a Happy Trail. Our Pony Planet program gives young equestrians an opportunity to spend 3 hrs with us, riding, learning horsemanship, working on groundwork, building a bond with the horses, practicing leadership, and forming friendships. This program is offered as a monthly subscription. Unfortunately we cannot provide make up days for this program as it is ongoing and spaces fill. Please call us for availability. If the program is filled, we run a wait list. Thank you! Whether you're looking to help prepare your child for Kindergarten or just supplement their learning this summer, we offer this nature, farm and garden based educational program over summer for children 4-6 years old. *New this Year* Down in the Barnyard is offering two distinct programs. Farm Buddies: Our original program continues to bring outdoor based preschool activities to young children, ages 4-6. Nature Explorers: Outdoor educational discovery of the wonders of nature in our fields and forest on the farm for children ages 6-8 and 8-10. Have you always wanted to learn about horses, but never had the opportunity? Or did you used to ride and would like to ease back into the saddle? Then come join us weekly for coffee, tea, and some quality horse time guided by Bev & Susie. We'll cover horse psychology, ground work, building partnerships & have a bit of calm time in the saddle. Pony Planet is our most popular group lesson program. In our serene farm setting, each participant learns about horsemanship, riding, horse care, and teamwork. This program is designed for children ages 6-12 years, from beginner to intermediate level. We will consider other applicants on a case by case basis. During Summer, (June - Aug) our Pony Planet will run in weekly, 4-day sessions. Select preferred dates in the drop down menu. You may fill the forms out in advance and send via email, bring them with when attending your scheduled lesson, or complete them on the first day of class. Without them, riders cannot participate. Also, upon receipt of payment we will send a confirmation of your reservation with directions to our location.